Falconara Albanese is a centre just inland of the Tyrrhenian coasts of Calabria near to Cosenza. Its foundation came about during the XV century, following the migration of seven Albanian families, who arrived in Italy by following Elena, Giovanni Castriota, the King of Albania's sister, and Giorgio Castriota Skanderberg's daughter. She arrived to marry Prince Bisignano Sollazzi. Initially, allocated nearer the coast, at the beginning of the XVI century, they moved to higher ground to shelter from Turkish incursions. 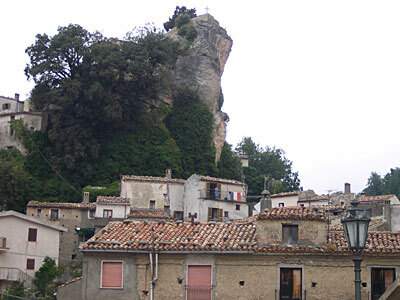 Its name seems to be derived from the presence of some hawks on the rocks known as Castelluccia. Falconara Albanese was a rural home of Fiumefreddo Bruzio and Sanseverino property until 1528, the year in which it passed hands to the Marquises of Rende, who remained in power until the end of feudalism (1806). Here one can visit the San Michele Parochial and the Madonna del Buon Consiglio Church. The Castelluccia rock dominates from on high, which can be approached through stairs allowing the visitor to also enjoy a beautiful panorama.